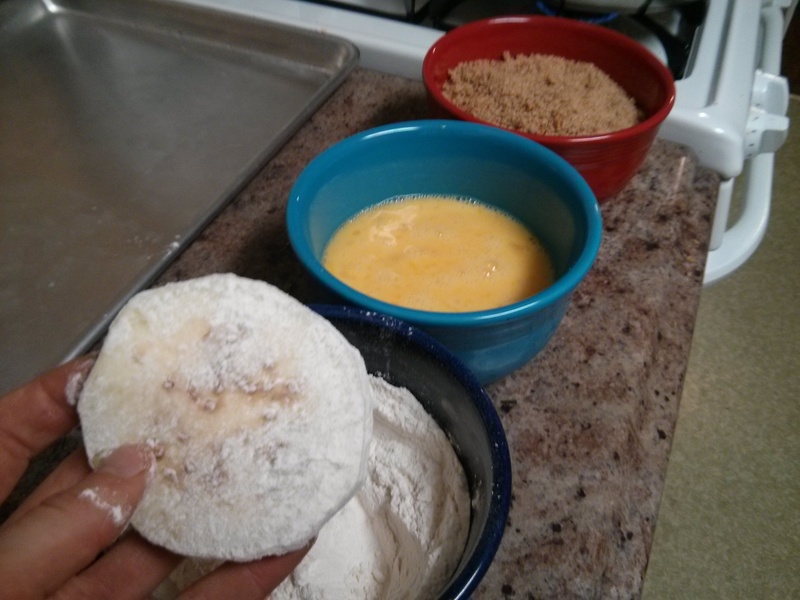 If you saw the Eggplant Parmesan, Part 1 post the other day, then you know my method for making fresh bread crumbs. 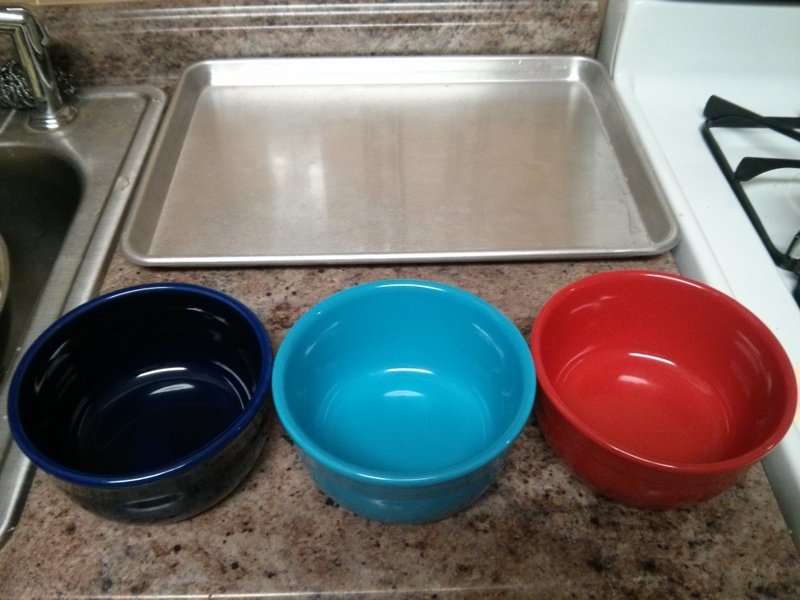 You’ll also know from Part 1’s first picture that I had two eggplants set and ready to go for Part 2. While this would be a perfectly good number to work with for this step – the prepping and cooking of the eggplant – I was thinking during the day yesterday, If two is good, why not three? So I stopped at a farm stand on the way home and got another one. 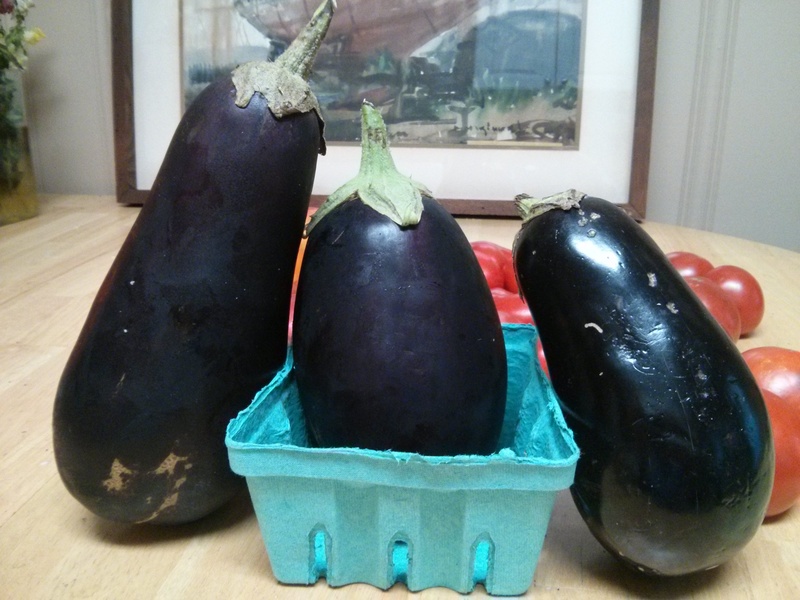 Before getting started last night, I also took an eggplant family portrait. You can tell they love each other. And so then with the group shot taken, it was time to begin. Here are the basic steps and some notes. I’ve seen a lot of recipes include this step (the sitting time varies), with the added suggestion of using a colander as an aid. 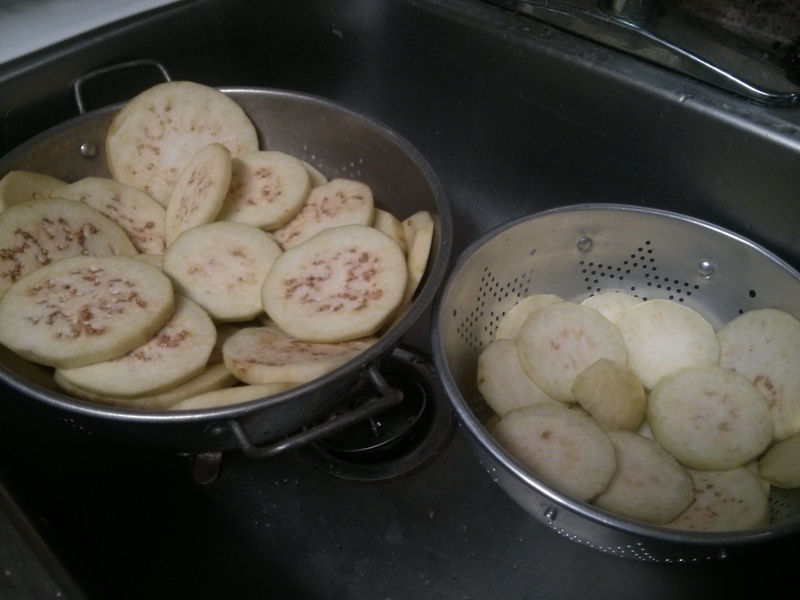 I ended up doing it this time (I let the eggplant slices sit while I went to my class last night), but usually I just do the salt-sprinkle and move forward when I’m ready for the next step. 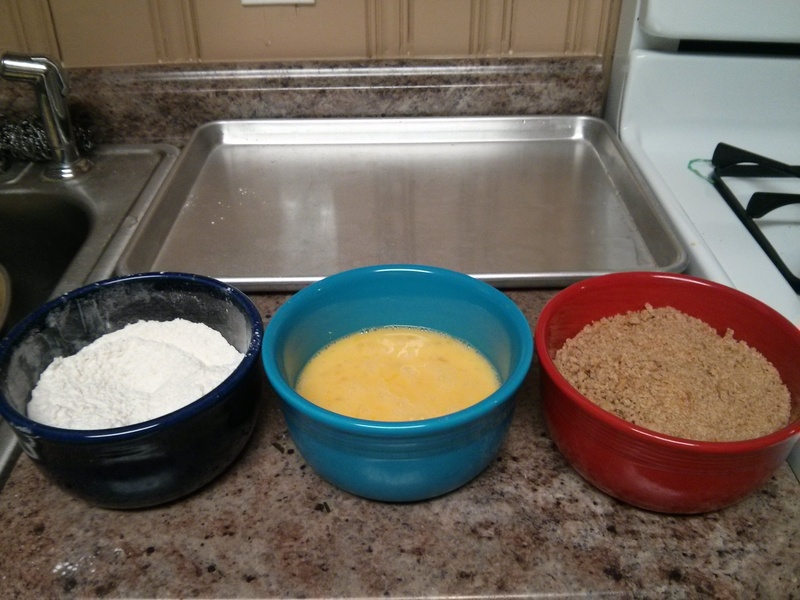 Set up the assembly line for the breading – flour, eggs, bread crumbs. 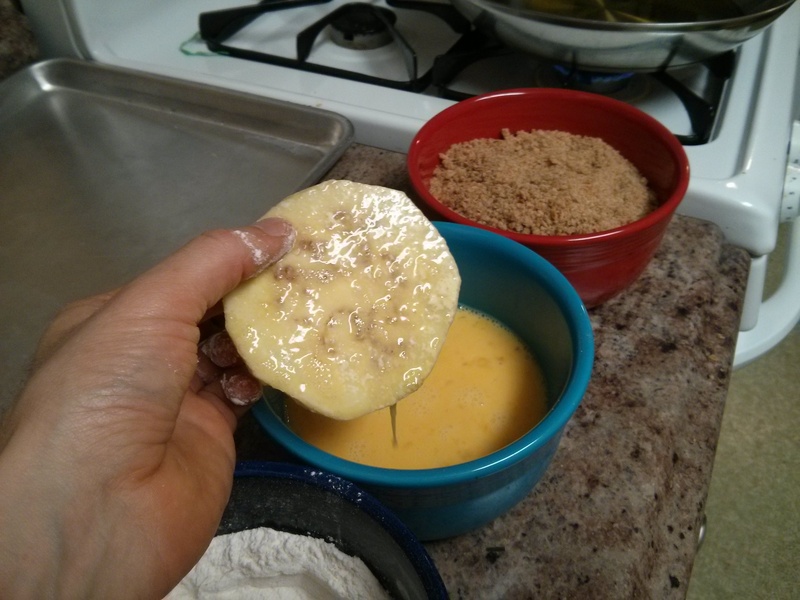 Then do the dipping – take each eggplant slice, and making sure to coat both sides, go from one bowl to the next. 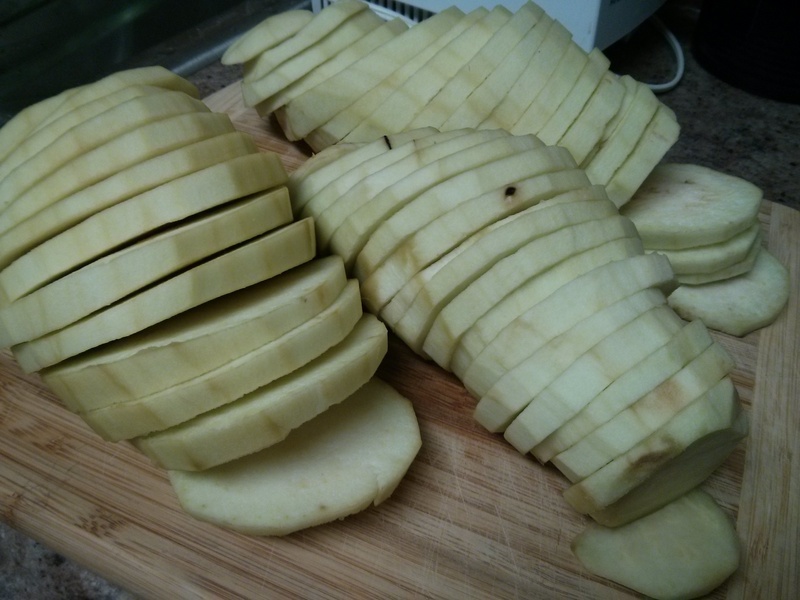 At this point, you could get all the eggplant slices coated and ready, or, if you’re like me and decide to go big and use three eggplants, you could start the frying and finish the rest of the assembly line at the same time. 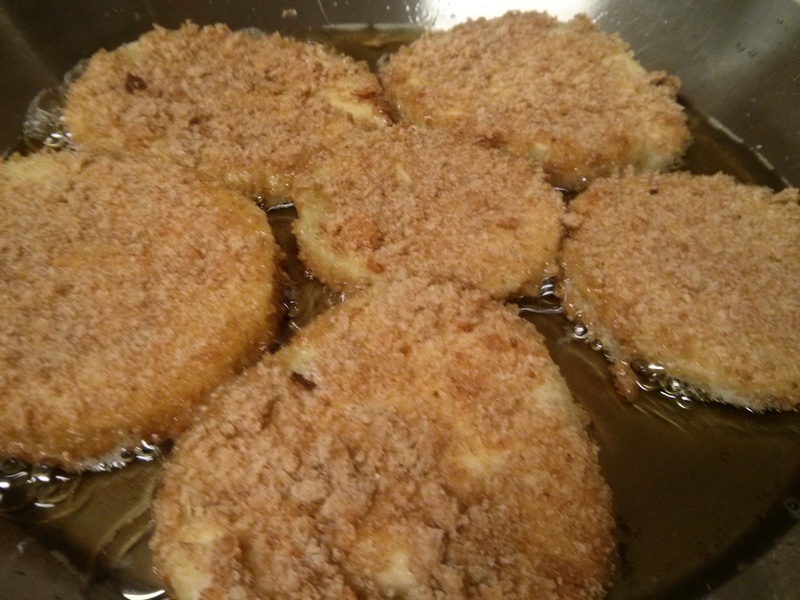 Cook the breaded eggplant slices. When the slices are done, put them on a plate with a paper towel. 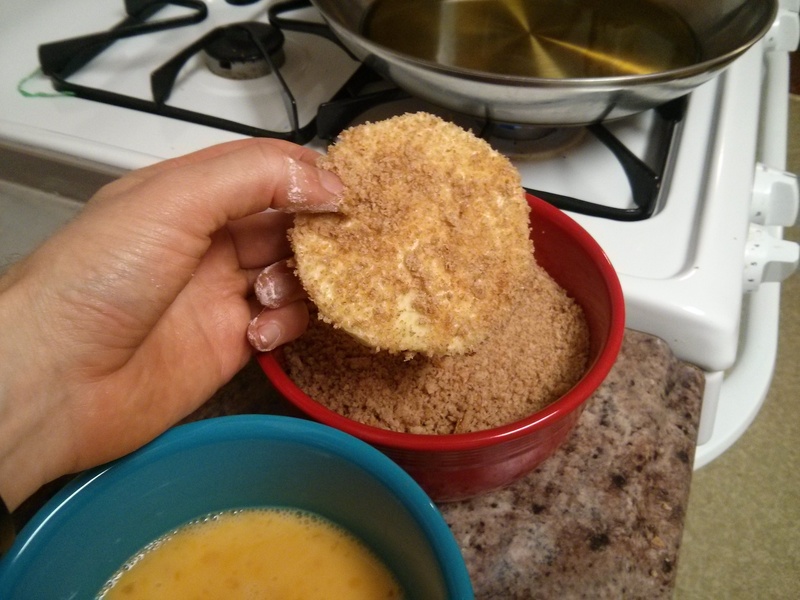 As the plate gets full, add another paper towel, and then continue on with the layers on up. 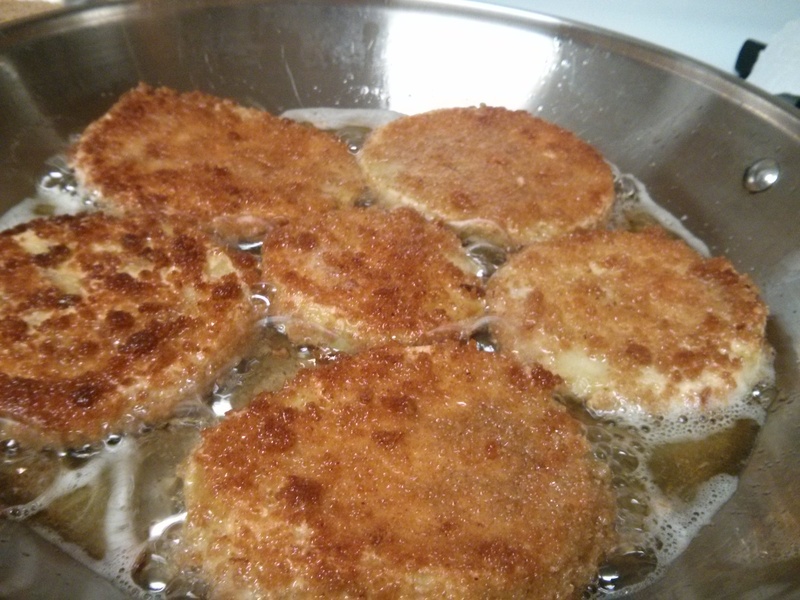 The key to the frying step is getting the amount of oil and the temperature-setting right. I try to keep the olive oil base-layer consistent throughout, which means adding a little more oil as I go (I tend to add a little with each new batch or so of eggplant slices). And that’s it and your done! 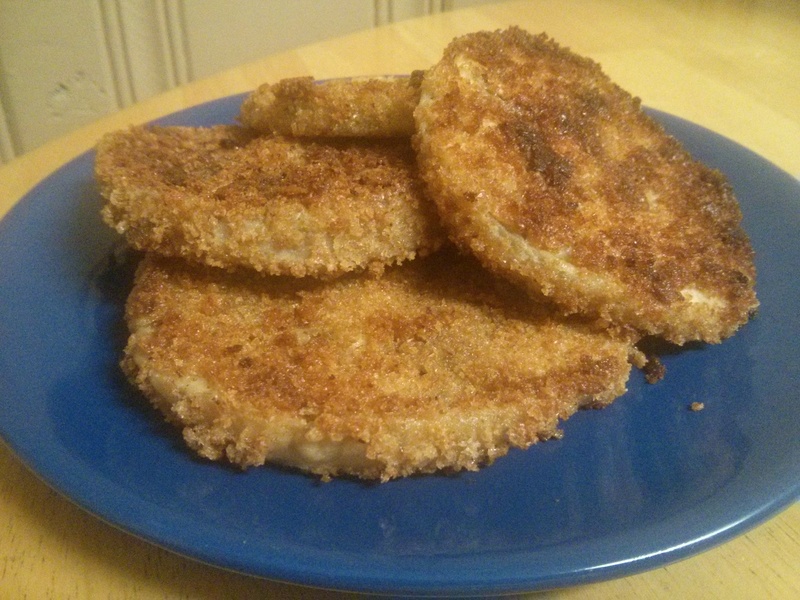 Congratulate yourself by eating a few of the fried eggplant slices, whether or not you’ve already had some along the way. So good. Just remember to save a few for making the Eggplant Parmesan later on. Next up: making the tomato sauce. 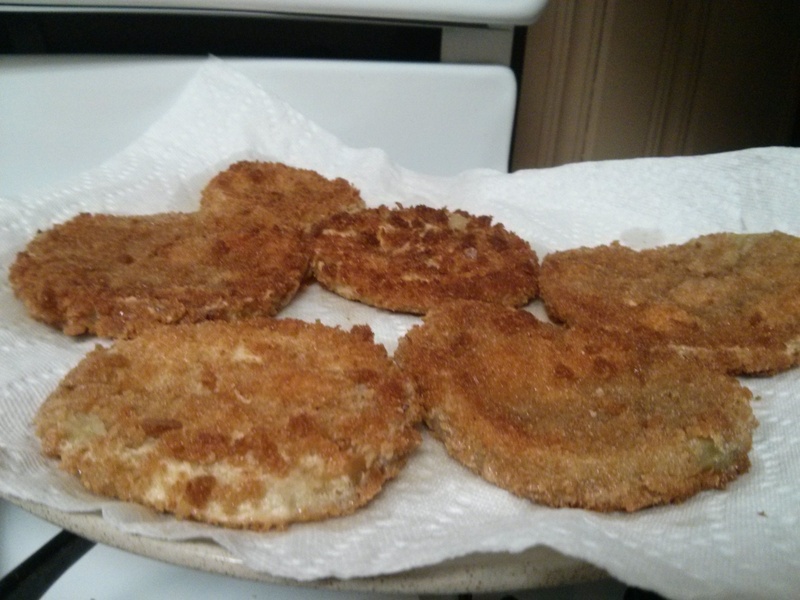 This entry was posted in Uncategorized and tagged assembly line, eggplant parmesan, family picture, food, fried eggplant, vegetarian on October 9, 2014 by dave379.